The November issue of NARC. magazine is out now! Our cover stars are Hen Ogledd, who are about to release the dizzyingly experimental but resolutely pop-infused Mogic onto an unsuspecting world, Lee Fisher was intrigued to find out how they came up with this magical fever-dream of an album. Exclusive images by David Wala. In the News section, we check out Endem & Leum at Voodoo Café; Munro all-dayer at The Green Room; Acid Mothers Temple at The Cluny; Parquet Courts at The Boiler Shop; Byker Grave festival at Star & Shadow Cinema; Martha Hill at Westgarth Social Club; Pip Blom at Think Tank? ; A Festival A Parade EP release; Courtney Barnett at Northumbria University; The Pale White EP release; Leddie MC album release; Mary Lattimore at The Waiting Room; 100 Years events at The Boiler Shop and much more. 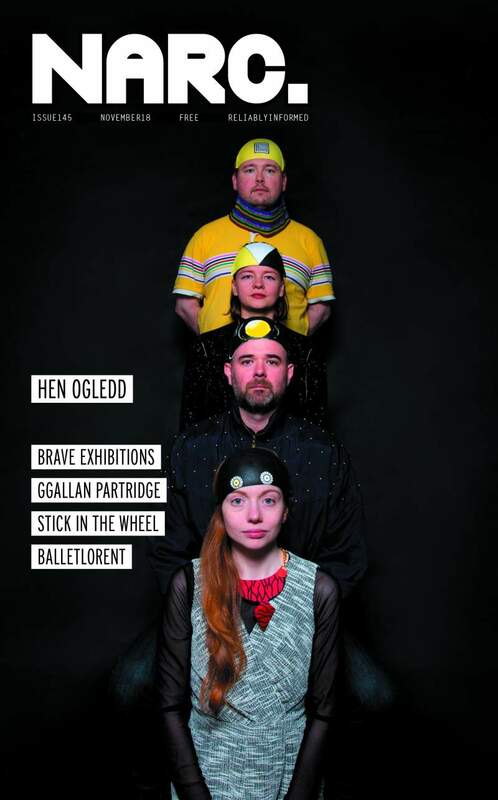 In the Culture pages find out about balletLORENT at Northern Stage; Lady Kitt’s WORTH at Ampersand Inventions; Profile articles on Holly Gallagher and Scott Turnbull; It’s Different For Girls at Live Theatre; BALTIC Late; The Storm at Dance City; Exposed: The Naked Portrait at Laing Art Gallery; Ouseburn Open Studios; Abandoman at The Stand; Katherine Tanney at Alphabetti Theatre; Dylan Moran at Tyne Theatre & Opera House; Emily Hesse at Workplace Gallery; Daniel Sloss at The Witham; Books On Tyne; reviews of Clear White Light at Live Theatre, Dave Gorman at City Hall, Heather Phillipson at BALTIC, Future Bodies at Northern Stage and much more. Interview-wise, Ali Welford talks to the BBC Radio 2 Folk Artist of the Year Karine Polwart about political themes and family ties ahead of her show in Gateshead; with their debut Newcastle show this month, Lee Fisher spoke to Nicola Kearey and Ian Carter of Stick In The Wheel about those typically folk topics of auto-tune, mixtapes and pirate radio; Lee Fisher chatted to Terminal Cheesecake guitarist Gordon Watson about collaborations, creativity and not being veterans; new electronic duo Badger tell Mark Corcoran-Lettice about their playful, surreal music; Sarah Wilson talks to DIY punks GGAllan Partridge about their extraordinary debut EP; Mark Corcoran-Lettice finds out more about dark, vivid world of Penance Stare; Damian Robinson talks to duo Tunnel Club about creating their own electronica ecosystem in the North East and Linsey Teggert speaks to Sunderland trio White Legs about their debut single. Plus, Lee Fisher spoke to promoter Joel Thomson about Brave Exhibitions festival – “the weekend festival based on the theme of my taste in music”; and Nick Wesson finds out more about the newest all-day festival to hit Teesside, The Gathering Sounds; and there’s Mixtape hijinks from Waheela, who talk about programming for this month’s GNAW Festival. Review-wise, we cast our ears over demos by Souls of Jack Ketch, FoxRiver, Great Waves, Leopard Rays and Lewis Curry; albums by Rex Regis, Rattle, Jacco Gardner, Chelsea Hare, Chorusgirl and more; track reviews of Counterfeit Youth, Eddie & The Valkyries, George Boomsma, Fever Days and Tall Shaves among others; plus a bumper crop of reports from live shows including Idles, Anna Calvi, Hollie Cook, Cocaine Piss, Virginia Wing, Horse Feathers and many more.